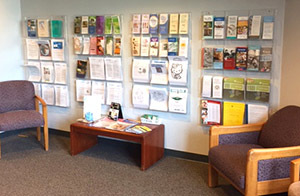 Northeast Clinic’s patient and family advisory council suggested a new patient information center in the clinic waiting area. Recommendations from the Northeast Family Medical Center patient and family advisory council (PFAC) are improving the patient experience at the clinic. PFACs are groups of patients and families who volunteer their time to provide feedback to clinic leadership. In the spring of 2014, Taryn Lawler, DO, who was a resident at the time, spearheaded the Northeast PFAC as part of her community health project. The Northeast PFAC now has eight members, one of whom serves as the lead. It meets monthly with co-chairs Julie Kurt, LPN, and Susan Golz, LPN. Moving an outdoor bicycle rack to a safer location near the clinic’s main entrance. 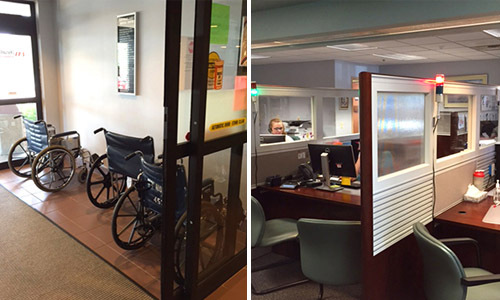 Above (L-R): Wheelchairs moved to the main entrance and new “stop” and “go” lights in the reception area. 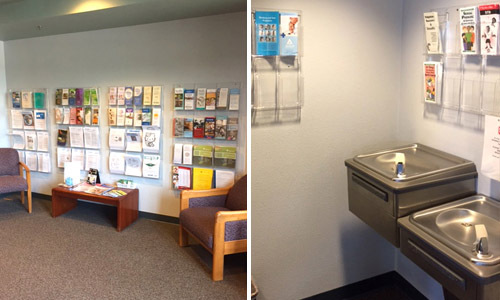 Above (L-R): The new patient information center in the waiting area; sensitive information moved to a more private area. Kurt said that PFAC members and clinic patients alike have commented on how happy they are to see the changes. She added that several PFAC members have also served as “test patients” for UW Health at the American Center. Moving forward, the PFAC is now developing a mission statement and working to recruit more members. It’s also offering feedback on two new initiatives: one on advanced care planning, and one on what patients perceive to be their care team. “The PFAC has become an important part of change at Northeast, whether it’s the clinic’s expanded hours project, communications to patients, advance care planning program or how we share community information,” explained Clinic Operations Manager Kevin Anderson, MBA. If you are considering ways to more actively engage your patients and their families in your clinic improvement work, please contact Sandy Salvo, program manager for UW Health’s Patient and Family (PFA) Partnership Program at SSalvo@uwhealth.org. Anderson said there are many ways to hear patients’ voices, and Sandy can provide resources and guidance to help you consider which approach is best for your situation.